Cannot create a linked server to Oracle. Applies to: SQL Server 2008 R2 Enterprise Edition, Windows Server 2008 R2 Enterprise Edition. 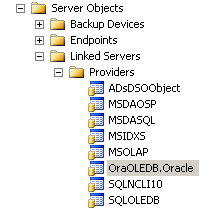 Cannot create an instance of OLE DB Provider "OraOLEDB.Oracle" for linked server "RH6I". We enabled the option "Allow in process" on the properties of the OraOLEDB.oracle provider, but we the error above still persisted. 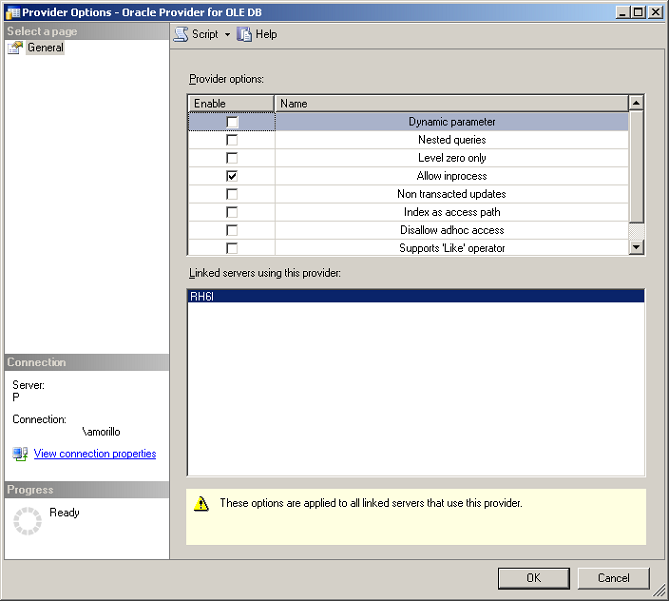 We found that a new release of the Oracle client was available (win64_11gR2_client or 11.2). Once we installed the new version and enabled the option "Allow in process", the linked server worked correctly. We were able to expand the Tables container on the linked server.